One of the great mysteries of climate science is the origin of the 100,000 year glacial cycles on Earth which have occurred over the last million years. These are interspersed with regular “short” interglacial periods coincident with a maximum in the eccentricity of the earth’s orbit. What exactly is it that triggers the collapse of the northern ice sheets to initiate an interglacial followed by a slow return to another 90,000 year long ice age? To put this into human terms. Homo Sapiens evolved during the last but one ice age 200,000 years ago and then migrated from Africa during the last ice age. All of human civilization has occurred only within the current warm interglacial period. We seem to flourish in the warm spells then migrate and adapt to survive the cold spells. Some 800,000 years ago there was a switch from a regular 41,000 year cycle of glaciations to the current 100,000 year cycle. This seems to have happened because after a 3 million year gradual cooling trend obliquity alone was insufficient to end an ice age. A threshold had been exceeded for the maximum in summer insolation to melt back the ever-larger ice sheets. Something else was now needed to tip the balance so that increased insolation could trigger an albedo meltdown of the ice sheets. The sawtooth- shaped collapse of the ice sheets ending the last glacial cycle are evidence that insolation changes now needed some external trigger to end an ice age. Are tidal forces enhanced by maximum eccentricity the trigger that is needed? Changes in summer insolation in the Arctic vary by nearly 100W/m2 with changing orbital variations of the earth. The last peak on the right is the LGM, but note that there are two other similar peaks within the last ice age which failed to end the glacial period. Summer insolation for different northern latitudes. Note how the total average insolation is much greater at the north pole than that at the equator. However the albedo of ice is ~0.8 so just 20% is absorbed. Less ice cover decreases net albedo leading to positive feedback and ice sheet collapse. The seminal work on long term solar system dynamics has been done over decades by the French group at Observatoire de Paris. – Laskar et al. on which the above curves are based. 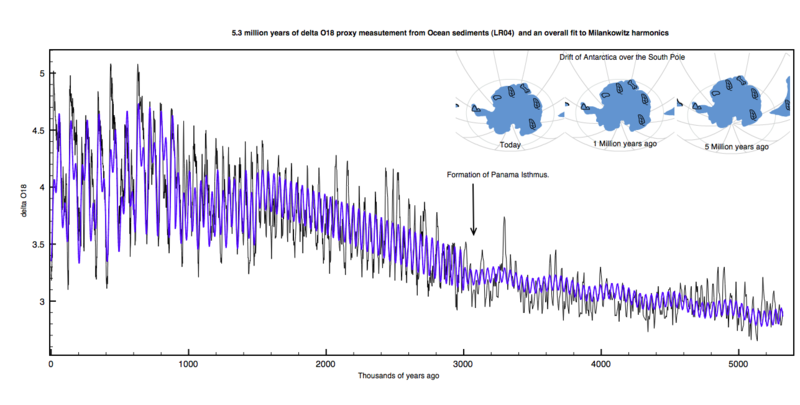 The 41,000 year cycle for glaciations for 3 million years can be understood as the net increase in insolation reaching both polar regions as seen in the following calculation. Comparison of N-S pole maximum insolation with precession and the difference in total insolation for both poles. Incredibly the integrated total energy absorbed at the N-Pole follows exactly the 41,000 y cycle as does the maximum N-S asymmetry. This is the cause of the glacial cycles prior to 800,000 years ago. Why then did glaciations switch to a 100,000 year cycle ? 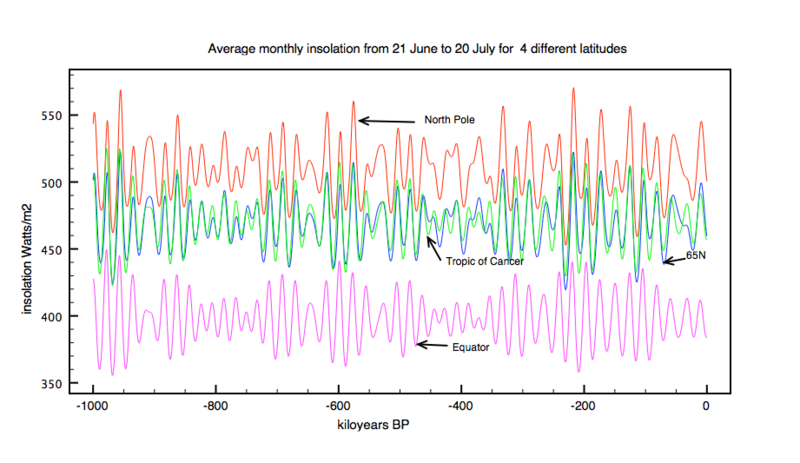 This shows a regular net increase in polar insolation with a 41,000 year cycle of inclination AND a North-South asymmetry offset by seasonal 23,000 year precession. The 100,000 year eccentricity cycle merely modulates the precession term and would have no effect at all if the earth’s orbit was circular. The most recent maximum in eccentricity was small (0.02) compared to previous maxima. This is because there is also a 400,000 year cycle modulating eccentricity maxima which can reach as high as 0.058. An interesting observation is that those ice ages which end with a small maximum eccentricity, like the last one, tend to have a much sharper sawtooth shape. It seems to be harder to tip them over the threshold needed for a runaway meltback with decreasing albedo. So what is that extra push needed to trigger an interglacial ? The Moon’s orbit around the Earth is elliptical, with a substantial average eccentricity (compared to other Solar System bodies) averaging 0.055. This value varies both during the lunar month and during a 206 day cycle due to varying tidal forces of the Sun’s gravitational field. This increases the eccentricity when the orbit’s major axis is aligned with the Sun-Earth vector and when the Moon is full or new. The combined effects of orbital eccentricity and the Sun’s tides result in a substantial difference in the apparent size and brightness of the Moon at perigee and apogee. Extreme values for perigee and apogee distance occur when perigee or apogee passage occurs close to a new or full Moon, especially when this occurs in the months near to Earth’s perihelion as this is when the Sun’s tidal effects are strongest. The current minimum distance of approach of the moon is 364,095 km. During the last 5000 years the distance of the Moon’s perigee has varied from 356,355 to 370,399 km. During the last glacial maximum (LGM) the eccentricity of the earth’s orbit round the sun was 0.02 compared to the current value of 0.12. This reduces the distance of closest approach of the earth to the sun (perigee) by 1% or a million km. As a result the maximum solar tide acting on the earth at perihelion was about 3% stronger than now because tides vary as 1/R^3. This then also causes the moon’s effective orbit to have a larger variation in eccentricity due to the stronger variation in the solar tides. We can estimate how large this effect is as follows. Variations in eccentricity of the moon’s orbit around the Earth-Moon barycentre. The moon’s eccentricity varies with distance from the sun. This is due to changes in solar tidal effects as the earth-moon system orbits the sun. Every 31 days the moon reaches its minimum distance to the sun and every 206 days the semi-major axis of the moon’s orbit around the earth aligns with the ecliptic plane so that the earth, moon and sun are aligned. During LGM with solar tides increased at perihelion by ~ 3% the eccentricity of the moon must increase. At the LGM the earth/moon’s eccentricity around the sun increased to 0.02 so the perihelion distance of the earth to the sun was reduced at perihelion by about 1%. However this still leads to about a 3% increases in the perihelion solar tide on earth. These tides also act on the moon’s orbit increasing the maximum lunar eccentricity and reducing the shortest distance of approach to the earth by about 7%. Combining together both the perihelion lunar tide with the perihelion solar tide we can estimate how much larger perihelion spring tides would have been on earth 20,000 years ago. The total increase in “perihelion” spring tidal forces were potentially 24% greater than today (21% lunar and 3% solar). Summer insolation in the polar regions at LGM was a maximum due to optimum alignments of inclination and precession. However such maxima had already happened twice before during the last glaciation but were insufficient to melt back the ice sheets. This third time sea level had reached ~ 100m lower than now in the Arctic Ocean, and (as pointed out by Chiefio) scouring of the sea bed shows that it touched the sea bed at depths which are now up to 1000m in places. Bathymetry of the Arctic Ocean curtesy NOAA. 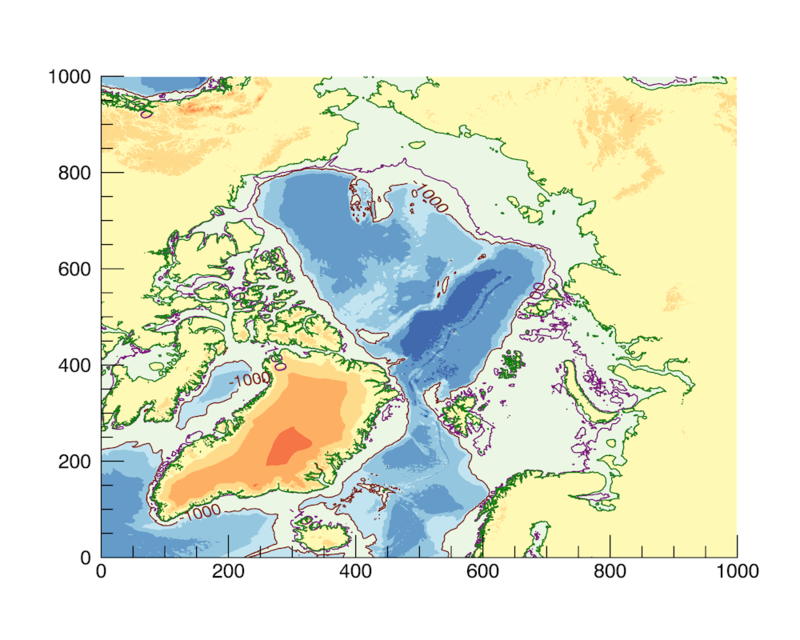 The 100m contour shows the sea level 20,000y ago and the 1000m contour shows the maximum depth of sea ice. The Bering Straights were closed and there remained just a narrow deep channel of ocean that connected the Arctic to the North Atlantic. The Arctic was essentially thermally isolated with a minimal AMOC. Strong tides would have increased regular flows of water in and out of the North Atlantic. In addition the rise and fall of the tides acted to lift and shift the thick sea ice off the ground. Both of these processes help the strong summer insolation to melt back the ice through physical movement. Perhaps more importantly the large ice sheets over North America and Europe are themselves subject to structural stresses caused by the regular tidal forces. We also have seen previously how maximum tractional forces in the Arctic coincide with summer months every 50 years or so. Perigean spring tides occur when the earth, moon and sun all align with the earth at perigee with the sun. At such times we get the largest tides on earth. These too also vary over longer periods of 1823 years as discussed in the paper by Keeling and Whorf. 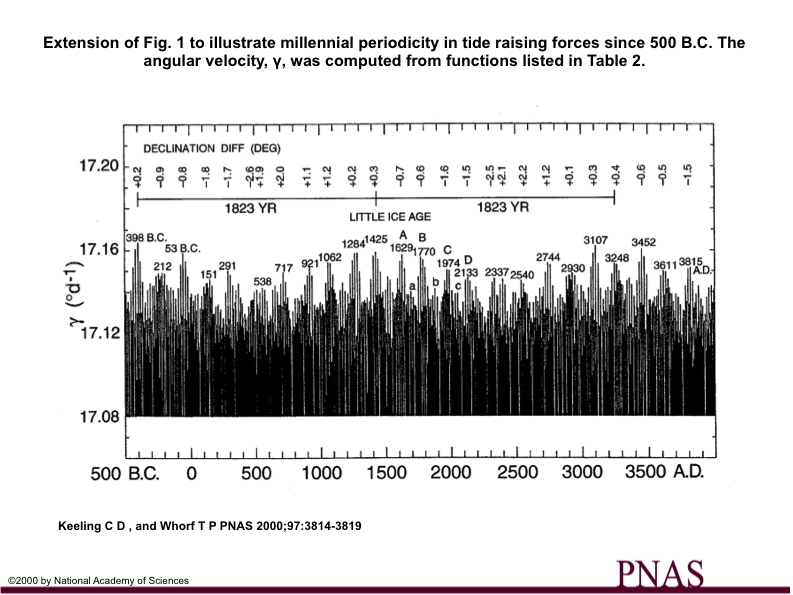 Evidence of long term variations of 1823 years in lunar tides . Keeling and Whorf. So what are the conditions needed to end a glaciation? A maximum of insolation at northern latitudes in summer months. The proposal is that stronger tides are needed to tip the balance so that insolation can begin a collapse of the ices sheets accelerated through albedo feedback and rising sea levels. Are tides the last straw that breaks the camel’s back ? Note: This post has been influenced by Chiefio’s new post: Arctic Flushing and Interglacial Melt Pulses which is well worth reading. This entry was posted in Climate Change, climate science, Ice Ages, Paleoclimatology, Science and tagged Ice Ages, Milankowitz., Tides. Bookmark the permalink. Maybe a weight distribution issue? These discussions show the amount of evidence pointing to these scenarios. Would you consider this an option? I noticed this article today, thought you might be interested in it. The 120m sea-level drop during the Last Glacial Maximum (LGM; 18–22 kyr BP) had a profound impact on the global tides and lead to an increased tidal dissipation rate, especially in the North Atlantic. Here, we present new simulations of the evolution of the global tides from the LGM to present for the dominating diurnal and semidiurnal constituents. The simulations are undertaken in time slices spanning 500 to 1000 years. Due to uncertainties in the location of the grounding line of the Antarctic ice sheets during the last glacial, simulations are carried out for two different grounding line scenarios. Our results replicate previously reported enhancements in dissipation and amplitudes of the semidiurnal tide during LGM and subsequent deglaciation, and they provide a detailed picture of the large global changes in M2 tidal dynamics occurring over the deglaciation period. We show that Antarctic ice dynamics and the associated grounding line location have a large influence on global semidiurnal tides, whereas the diurnal tides mainly experience regional changes and are not impacted by grounding line shifts in Antarctica. Looks interesting ! Now add in a 20-30% increase in maximum spring tides ….. Simplicity intensifies, Clive. The key to triggering the beginning of glaciation and the end of glaciation, remains right under your nose. Let me know when your mind is empty enough to accommodate verifiable information.